Erina began her training at age 8 in New York, with Logrea Dance Academy and Westchester Ballet Company. At the age of 15, she got accepted into SLK Ballet School, under the direction of Sara Knight. Her repertoire includes Clara in The Nutcracker, Princess Florine in Sleeping Beauty, Don Quixote Pas de Deux, and Flames of Paris Pas de Deux. 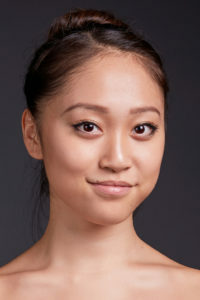 During her training, Erina was selected for an exchange program with English National Ballet School in London in the spring of both 2015 and 2016. Erina has also spent summers training at ABT in New York, Bolshoi Ballet in New York, SLK Ballet and Cincinnati Ballet. This is her second season as a Eugene Ballet Academy Aspirant in training with Eugene Ballet.